Magic Wand is the signature for every magician. It represents magic. 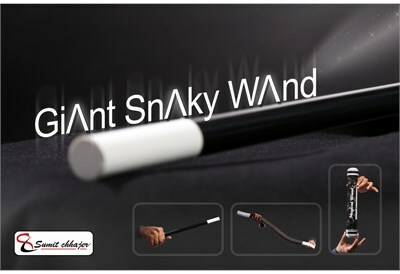 Giant Magic wand is the powerful tool for stage magic, parlor magic, kids show or for comedy magician. Giant snaky wand creates magic as well as comedy. This will entertain with hilarious riot of laugh with kids and adults. Effect :- At any movement in your show the magic wand immediately transforms to a Giant Sanky Wand. Has the power to perform at any situation. Comes with unbreakable and easy to carry packing.